This post concerns an inspirational quote that is often misattributed to Harriet Beecher Stowe and Joan Baez. Read on to learn who really wrote it. For this misquote, it looks like the quote virus has spread its ugly tendrils to the outer reaches of the universe. Not only is it found misattributed to Harriet Beecher Stowe but Joan Baez gets credit as well. Of the 124 websites I looked at featuring this misquote, 66 are websites or web pages strictly dedicated to quotes. Stowe is the more popular misattribution with 47 occurrences, and Baez receives the remaining 19. The 58 non-quote websites consist of mostly blogs followed by businesses, women’s topics, education, and quotes paraphernalia for purchase. There were seven more pages I did not look at as my eyes were bleeding after perusing 124 sites. So my statistics are less than what is actually out there in cyberspace. Additionally, I discovered three books of quotes also misattributing the quote to Stowe and Baez; there are most likely others. Based on the above numbers, quote websites and blogs are the main source of infection for this misquote. Be very wary when obtaining quotes from these sources. As I’ve discussed in previous posts, in the age of the internet, all it takes is one website or one book with an erroneous attribution to start a pandemic spreading the misquote far and wide. This phenomenon occurs because most quote websites derive quotes from other quote websites and quote books and then bloggers get their quotes from these websites and books and so on and so forth. The result is that people like Eudora Welty don’t get full credit for their amazing words and thoughts. I must confess that before today I was not familiar with Eudora Welty (1909–2001), the true originator of today’s quote. She was an American author who won the Pulitzer Prize for her novel The Optimist’s Daughter. She also received recognition for her literary contributions through various awards and honors, including the Presidential Medal of Freedom in 1980. 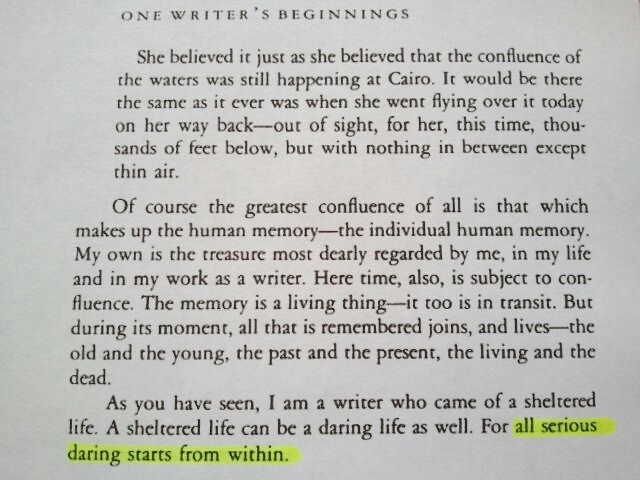 This quote is from her memoir One Writer’s Beginnings. It is a shame that it is being attributed to other people as she was obviously a remarkable woman whose words should be honored and given proper credit.